Red Blue Green Silk Scarf Handpainted Handmade Shawl RETRO REVAMPED, by Silk Scarves Colorado. Select Your SIZE! Birthday Gift, Christmas Gift, Anniversary Gift. Bridesmaid Gift, Valentine Gift. Gift-Wrapped. Elegant Handmade Silk Scarf. Hand Dyed Silk. Handmade in Colorado, USA. 100% silk. This is a 100% Chiffon silk scarf separated into three segments - red, blue, and green - featuring geometric shapes in shades of red & orange, blue & purple, and green & lime. All outlines are done in pewter. Decorated with accents in silver. It is very artistic design that makes a great accessory to any outfit. Silk Scarf Orange Brown Lime Yellow Hand Painted Silk Shawl EARTH LOVE, by Silk Scarves Colorado. Select Your SIZE! Birthday Gift, Christmas Gift, Anniversary Gift. Bridesmaid Gift, Valentine Gift. Gift-Wrapped. Elegant Handmade Silk Scarf. Hand Dyed Silk. Handmade in Colorado, USA. 100% silk. This is a 100% smooth silk scarf featuring multicolored meanders in shades of terracotta, green, lime, red, burgundy and brown. The segments are outlined in different metallic matching colors. It is a large-size silk wrap, chic and feminine. Hand Painted Silk Scarf. Red, Burgundy & Black Handmade Scarf MERLOT KISS, in Several SIZES. Silk Scarves Colorado. Hand Dyed Scarf 100% silk. Made in USA. 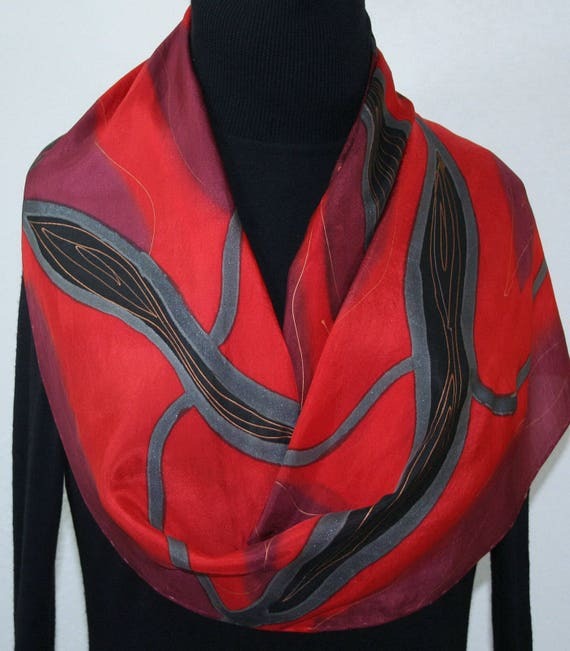 This is a 100% smooth silk (habotai silk) scarf in shades of red, burgundy and black. Outlines are done in darker pewter. Decorated with accents in black and bronze. PLEASE SELECT THE SIZE YOU ARE INTERESTED IN, while placing the order. These are original sizes - slight shrinkage occurs due to the steam-setting process that makes the silk scarf colorfast. The positioning/size/distribution of the design's components will vary for each size - in order to correspond to the scarf's size. Silk-Wool Scarf Hand Painted Taupe Green Navy Blue Handmade Scarf AUTUMN WINDS, by Silk Scarves Colorado. Select Your SIZE! Mother Gift, Birthday Gift. Hand Dyed Scarf. Handmade Silk Scarf. Hand Dyed. Made in Colorado, USA. 100% silk. This one is a warm scarf in taupe, featuring abstract shapes in green; decorated with navy blue. Outlines are done in light metallic brown. - Silk-Wool Small/Medium Scarf: 11" x 60" (28 cm x 152 cm). - Silk-Wool Large Shawl: 14" x 72" (35 cm x 183 cm). Orange Black Silk Scarf Hand Painted Silk Shawl BRONZE TULIPS, by Silk Scarves Colorado. Select Your SIZE! Birthday Gift, Christmas Gift, Anniversary Gift. Bridesmaid Gift, Valentine Gift. Gift-Wrapped. Elegant Handmade Silk Scarf. Hand Dyed Silk. Handmade in Colorado, USA. 100% silk. This is a 100% smooth China silk scarf in the contrasting colors of burnt orange and black, featuring stylized tulips in raspberry. Outlines and decorative accents are done in gold. Silk Scarf Blue Brown Handpainted Hand Painted Shawl COLORADO RIVERS, by Silk Scarves Colorado. Select Your SIZE! Birthday Gift, Christmas Gift, Anniversary Gift. Bridesmaid Gift, Valentine Gift. Gift-Wrapped. Elegant Handmade Silk Scarf. Hand Dyed Silk. Handmade in Colorado, USA. 100% silk. This is a 100% habotai silk (smooth China silk) scarf in shades of blue, brick red (as the color of the Red Rockies in Colorado) and some brown. Decorated with bronze accents. Green Teal Silk Scarf Hand Painted Chiffon Silk Shawl GREEN TRANQUILITY, by Silk Scarves Colorado. Select Your SIZE! Birthday Gift, Christmas Gift, Anniversary Gift. Bridesmaid Gift, Valentine Gift. Gift-Wrapped. Elegant Handmade Silk Scarf. Hand Dyed Silk. Handmade in Colorado, USA. 100% silk. This is a 100% Chiffon silk scarf featuring grading segments in shades of green - teal, lighter and darker olive, sage green, darker green. Segment dividers are beautiful accents, done in matte turquoise and silver. It is a very feminine silk scarf that makes a great accessory to any outfit. Beige Tan Ivory Silk Scarf Hand Painted Handmade Shawl SEASHELL DREAMS, by Silk Scarves Colorado. Select Your SIZE! Birthday Gift, Christmas Gift, Anniversary Gift. Bridesmaid Gift, Valentine Gift. Gift-Wrapped. Elegant Handmade Silk Scarf. Hand Dyed Silk. Handmade in Colorado, USA. 100% silk. This is a 100% smooth China large-size silk scarf in very light seashell shades - beige, tan, cream, ivory. The wavy shapes are outlined in matte off-white/light beige. Decorated in thin accents in bronze. It is a very elegant square silk scarf - very chic and feminine, and makes a unique gift. Silk Scarf White Black Red Hand Painted Chiffon Silk Shawl COLORS CROSSROADS, by Silk Scarves Colorado. Select Your SIZE! Birthday Gift, Christmas Gift, Anniversary Gift. Bridesmaid Gift, Valentine Gift. Gift-Wrapped. Elegant Handmade Silk Scarf. Hand Dyed Silk. Handmade in Colorado, USA. 100% silk. This is a 100% Chiffon silk scarf in white and black, featuring artistic brushstrokes in bright shades of red, blue, and yellow; with thin accent lines in black, white, silver, and pewter. This silk scarf makes a very pretty accessory to any casual outfit. Purple Silver Silk Scarf Hand Painted Silk Shawl BLUEBERRY ROSES-2, by Silk Scarves Colorado. Select Your SIZE! Birthday Gift, Christmas Gift, Anniversary Gift. Bridesmaid Gift, Valentine Gift. Gift-Wrapped. Elegant Handmade Silk Scarf. Hand Dyed Silk. Handmade in Colorado, USA. 100% silk. This is a 100% smooth silk (habotai silk) scarf in two shades of purple - warmer purple and cooler eggplant, featuring silver roses at each end of the scarf, plus some in the middle. It is a very elegant scarf that is a great accessory to more formal outfits.